A team of students from Northwestern Pritzker School of Law won the ABA Law Student Division Negotiation Competition held at the ABA’s midyear meeting in San Diego last week. 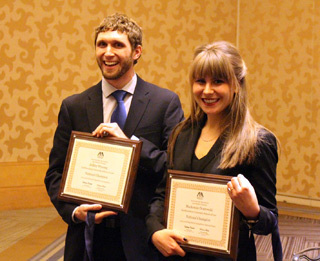 Mackenzie Drutowski (JD ’16) and Jeff Wysong (JD ’16), who won the regional competition last fall, beat out teams from across the country, including finalists from University of California, Berkeley School of Law and Liberty University School of Law and fellow regional finalists from the University of Illinois. The final competition required them to negotiate four different problems in two days, on the topic of information law. This is the third year in a row a team from Northwestern Law—coached by Alyson Carrel and Daniel Gandert, clinical assistant professors in the Bluhm Legal Clinic’s Center on Negotiation and Mediation, and Lynn Cohn, the Center’s director—has competed in the national ABA Negotiation Competition.